Puerto Rico is rife with forests, fortresses, and architectural splendor, but there's no doubt that for millions of tourists, it's the glittering beaches of Puerto Rico that beckon. And with over 270 miles of them, there's a sandy patch for just about everyone on this island. One beach stands above all others in Puerto Rico, and it's the reason why so many people skip the mainland and travel straight to ​Culebra Island, just a 45-minute ferry ride off the east coast. 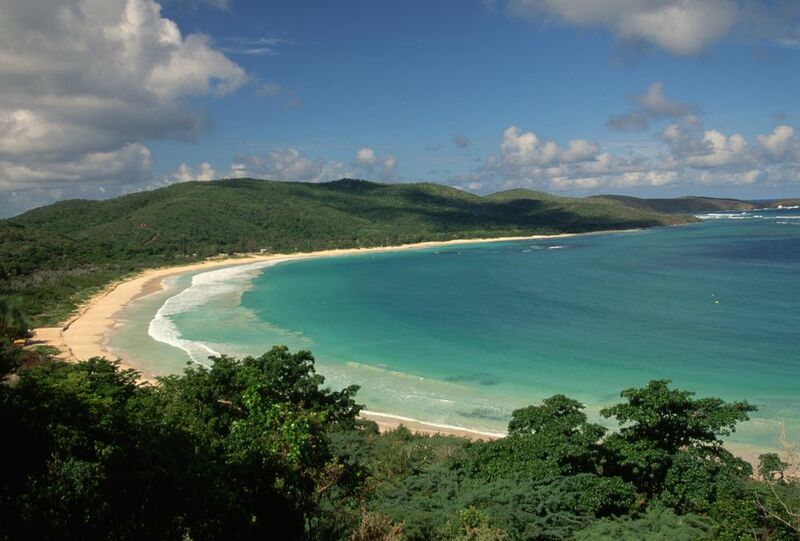 Flamenco Beach dazzles with its many hues of blue and green water, the low green hills encircling it, and its wide, deep horseshoe of golden sand. It also has the largest camping grounds, so sling up your hammock by the beach and stay for a while. If you want something beyond the water and sand, there's a colorful bit of social commentary at Flamenco, as well-two brightly painted tanks, relics of an unwanted naval presence on Culebra Island. In the small hamlet of Cabo Rojo on the island's west coast, you'll find Playa Sucia (literally "Dirty Beach"). But don't let its name fool you-this stretch is one of the most pristine in Puerto Rico. It does take a bit of walking to get there, however. When you see Sucia's wide crescent of sand, though, the lighthouse set on the bluffs as if it were a painted landscape, and the calm waters of the Caribbean lapping lazily against its shores, the hike will seem worth it. There are many incredible beaches on Vieques Island and picking the best of them is a tough call. The easy choice is Sun Bay, the most popular of all the beaches on the island. For one, it's the most accessible, with ample parking and facilities (both rare commodities here). Secondly, this is a pristine and picturesque stretch of sand that's large enough to accommodate its many fans. Ocean Park is arguably the best beach in San Juan. It's a wide stretch of sand that doesn't attract the hordes of tourists that you'll find on nearby Condado Beach and Isla Verde Beach. As such, it's got a more laid-back and relaxed feel to it, which isn't always easy to find in the bustling, busy capital. Ringed by some of Puerto Rico's finest hotels, Isla Verde is the beach to go if you love to people watch. It's one of the busiest (and most popular) beaches in the country, thanks to its quintessential Caribbean beach vibe. Hotels lining its shores, wave runners skimming across the water, parasails soaring overhead... it's possible to spend an entire vacation here. And there's nothing wrong with that. Flamenco Beach gets all the attention in Culebra, but Playa Tortuga, located on smaller sister island, Culebrita, is almost more impressive, not to mention it's more remote and far less busy. You need a boat or a water taxi to get here, but once you do, you'll be rewarded with a lovely beach that is as beautiful as it is isolated (there's only one man-made structure to look at). Rincón, on Puerto Rico's west coast, offers miles and miles of beautiful beachfront, but Barrero Beach is better for a few reasons. This long stretch of sand is ideal for romantic walks as you won't be dodging surfers and tourists, plus the sunset from here is simply breathtaking. And with the lovely Horned Dorset Primavera hotel serving as the backdrop, you can retire back to your beachfront villa or suite anytime. For sheer visual splendor, it's hard to beat Isla Palomonitos. This tiny spit of land off Puerto Rico's east coast suffered a fortunate accident when a passing hurricane swept away half of its foliage, leaving an absolutely gorgeous little white-sand beach in its wake. On busy days and holidays, you'll see Palomonitos ringed by boats, but if you can catch it on an off-day, it looks like a tiny slice of paradise. Playa Combate (or "Battle Beach") in Cabo Rojo is the longest beach in Puerto Rico and attracts a massive amount of crowds on the weekends. It's also a big party spot, especially when spring break rolls around. With its calm, shallow waters and miles of powder-soft sand, it's not hard to see why. Another pristine beach in Cabo Rojo, Playa Boquerón is one of the most family-friendly spots. Along the shore, there's a statue of pirate Roberto Cofresí, a local legend and Robin Hood-type figure. The beach also has excellent public facilities, and the calm, shallow, warm waters will keep the kids happy all day long.